Do you believe an affair starts in your thoughts? Part 2: The real reason you can’t get over your affair. Yes, they can, and they ALL do. Let me show you how. This is Part 1 of my series about how our thoughts direct our lives. but many of us often weren’t aware of it. Some call it the Think-Feel-Act cycle. Basically, our thoughts create our feelings, and those feelings contribute greatly to our actions, or behaviors. but we’ve often been unaware of it in our own lives. It’s the framework, which states how our behaviors can be traced back to the beginning to our thoughts. I’ll explain that more in a moment. I believe this concept just might be the single most important key to your affair recovery, whether you’re the unfaithful spouse, or the betrayed. It’s a tool you can use to get over heartache faster, and one that you can apply to many areas of your life. because many of you are still struggling, and I’ve been where you are; I know the struggle and pain. I used this concept as a huge first step in getting over my affair, and it was the beginning of the positive results I started to see. Let me explain further of how affairs starts in our thoughts. How many times have we ended up doing or saying something that we wondered how in the heck did I get here? Or, various versions of that question. I can give the top reasons why women have affairs, and I did give them. You can read that post here. But those were symptomatic of the other issue. The reasons “why women have affairs” can frankly be as varied as our preferences for certain flavors of ice cream. Yet, if we look deeper into WHY we actually had the affair, there’s a common thread in all of us. All affairs starts in our thoughts. Depending on how far out you are from your affair, you might not even remember what your thoughts were before the affair started. Maybe you blocked that part out in all the chaos that your affair caused within you and within the results that came because of your infidelity. But many of you, like me, can trace your affair back to the beginning-before it started-and you can remember what your thoughts were. The Think, Feel, Act cycle works like this. We have a thought, which led to our feelings about something, (our thought’s create our feelings), which inevitably lead’s to our actions or behaviors. There is a life coach, Brooke Castillo, who I’m learning a lot under her teachings. in understanding how this works in our everyday lives. which resulted in my behavior (or the action I took). This applied to me for past actions and current ones I’m working on changing now. Think of a bike, and how it’s built as a frame, brakes, handlebars and wheels. So let me explain why I like to call this- The BICYCLE CONCEPT. (‘Circumstance, Think, Feel, Act, Result Cycle’). 1. The Circumstance = the whole bicycle. It’s neutral. We can all agree if a bike was sitting in front of us, it’s a fact, there’s a bike there. 2. The handlebars are like your thoughts that will steer you in whatever direction you’re telling yourself with your thinking. 3. The wheels, are like your feelings, and they’re just going to go wherever you steer them with your handlebars (thoughts). 4. The action is how you got the bike moving (putting our feet on the pedals). 5. The result is your destination. Where are you going to end up after riding this bike? So,If you don’t like your destination (the result) you need to decide to stop (the brakes=another action). and change direction of your handlebars (changing the thought-replacing it with something else for a better result). 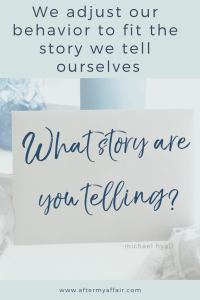 What’s the story you’re telling yourself about that circumstance? If you keep thinking those same thoughts that you did before the affair started, you’ll keep producing the same results. 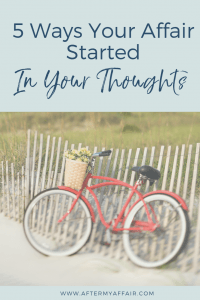 What was the circumstance that precipitated your thoughts? Did you believe you deserved a break and something for yourself because of what your circumstances were at the time? What were the feelings you had before the affair, or when it began? What were the thoughts you had that led you to those feelings? Can you see how those thoughts led to your feelings, maybe of desire to be wanted, or to feel special? when you eventually had the affair? Stop it when it starts interpreting a circumstance in a way you know will produce negative feelings and results later. My personal story is so clear of how my thoughts led to my feelings, which drove my actions to having the affair. (Read the 34 warning signs of emotional affair, and you’ll see what those thoughts, feelings and actions that often occur before a physical affair occurs). See if you relate to these warning signs too). But my thoughts were also the reason I kept relapsing back into the affair and acting out over and over even when I felt like I wanted to stop. I kept thinking, and constantly told myself, I couldn’t stop. Was that true? NO !! It was only a thought I told myself, which led to my feelings in believing I couldn’t live without him, which eventually led me to resuming contact in some way. But here I am 12 years later, no contact, and I’m happier than ever. And certainly MUCH happier than I was when I was in contact with him. Wow, eye opening isn’t it? I finally figured out what taking every thought captive means. to shut up the thoughts that wanted to barge in and take me back to the affair. and heal their marriage and their shame. In my next post, Part 2, I’m going to go into more depth and examples of each one of these parts. I’ll take that bike apart and break it down, so you can understand each part of this concept even more, and how it applies to your life everyday. Part of that post is a story of how I had to use this concept to redirect my thoughts just today! I’ll share that story with you. What about you? Do you relate to this concept? Can you see where your affair started in your mind first? Leave a (anonymous) comment below to share your thoughts! If you’re the unfaithful wife needing help and answers, click here.